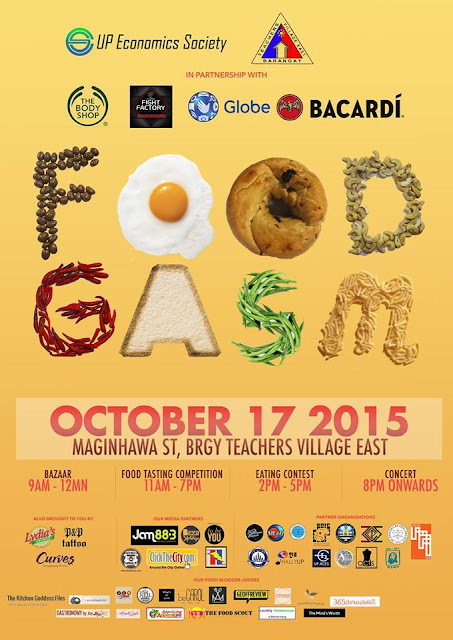 [i am a dekaphobic]: Foodgasm Goes to Maginhawa! Get ready for the yummiest event of the season! Get ready to taste and judge the best upcoming dishes the Metro has to offer. *Tickets are also available at the Barangay Hall and at the Ecosoc tambayan in the School of Economics, UP Diliman. Come in groups of 4 and battle it out with fellow foodies to win our cash prize and gifts from our sponsors. Get to hear some of the most promising acts and performers. 8PM onwards Admission is free! Shop with the various online shops and stores we have for you. Your favorite foodie event is back and tastier than ever, bring your taste-buds and we'll see you there! For inquiries and questions, kindly email us at upecosoc.financeproject@gmail.com or contact Miguel Ramos, 09273138714.